It’s fitting that I should be a regular contributor to the Exit Ramp section, which appears on the very last page of NJJN. After all, I’ve been reading the newspaper from back to front for most of my life (and it’s not even in Hebrew). Really. It was merely that what interested me was always toward the end. I’m a bit more sophisticated today, but I still read it backward. We used to call this weekly accounting of our community’s life just The Jewish News. Over time it expanded, absorbing other newspapers such as Newark’s Jewish Times and, decades later, The Jewish Horizon of Union and Somerset counties. In the late 1990s it became the New Jersey Jewish News and then appeared online at njjewishnews.com. In the old days I might have thought the “com” was a veiled connection to communism. Who knew then? It’s obvious that both The Jewish News and I have grown old together. But while the newspaper retains its youthful verve, I’m afraid that I’m just plain old. The paper always appeared in our Newark mailbox on Fridays. Not only was it welcomed by every member of our family, but we even fought over it. If someone misappropriated the family copy — in the days before the NJJN website was established — that was just tough luck! My stage in life dictated what I sought to read. I started this weekly reading habit when I was about 12 (66 years ago for those who care to know). 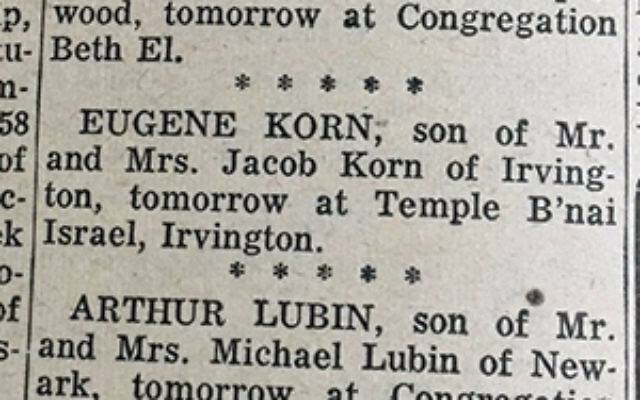 In those days I was looking for the bar mitzvah announcements. And there were many. Usually that included a picture of the kid, the shul where the coming-of-age celebration took place, and the names of the proud parents and grandparents. Of course I never sought out (or noticed) a bat mitzvah announcement. If there were any girls becoming bat mitzvah, they weren’t known to me; very few girls became bat mitzvah in the early ’50s. The bar mitzvah boys (men?) would celebrate according to their family’s means. In our Weequahic neighborhood that was often at one of the numerous catering establishments which had a pecking order of their own — Avon or Ann Gordon, or all the way up to the really fancy Clinton Manor. The less affluent had a kiddush in shul followed by a party at home for the boy’s friends. Those were the best. We kids hung out, realized that boys were boys and girls were girls, and eagerly waited to see what would happen when we were in the presence of a phonograph playing romantic music. When it came to dancing, the boys were often a head shorter than the girls, but no matter. It was much more fun than a fancy grownup party. Just a few years after my interest in the bar mitzvah announcements (which I continue to read today) piqued, I turned to the engagements. For reasons that escape me, this important part of the Jewish lifecycle is infrequently submitted to NJJN. But I do know that in the days of yore, it was always Jew engaged to Jew, and many of them were local to local. I hardly knew anyone in my generation who got divorced or was intermarried. Maybe those announcements had something to do with the immense pressure we felt to get married when we were in college. My grandchildren find it hard to believe that I was married at 20, but I doubt that the current crop of engaged couples in their 30s or 40s has a better success rate than we did. The professional wedding picture of the bride (never including the groom) was de rigueur. Somewhere in The Jewish News archives is the June 4, 1960, wedding of Rosanne Litwak to Alvin Skopp. Ours was a love story born in the Borscht Belt, and Miss Litwak (a kid, me!) imported Mr. Skopp (another kid, him!) all the way from Brooklyn. Of course, love and marriage were followed by the baby carriage and the announcements of new arrivals. In the fall of 1963 we welcomed Amy Jill Skopp. She was followed in later years by Lori Donna, Pamela Ann, and Peter Daniel. Obviously not every life followed the formula. Some didn’t have b’nei mitzvah. Some never married or had children. I still read all of the so-called social announcements from A-Z. But, in my dotage, I now focus on the obituaries. Yes, I often know those who died. Many are younger than I. What wisdom can I possibly impart here? None. My life goes fleeting by in the pages of NJJN.